The current position of the snow groomer is continually plotted to an accuracy of a few inches. The value that results after deducting the vehicle height is then compared with the depth value of a digital terrain model (reference depth) stored in the system. The snow depth at the current vehicle position is the difference between these two heights. In the snow groomer the GNSS receiver and the on-board computer continually calculate position, snow depth and other vehicle data, record it and present it on the touchscreen in the driver’s cab. 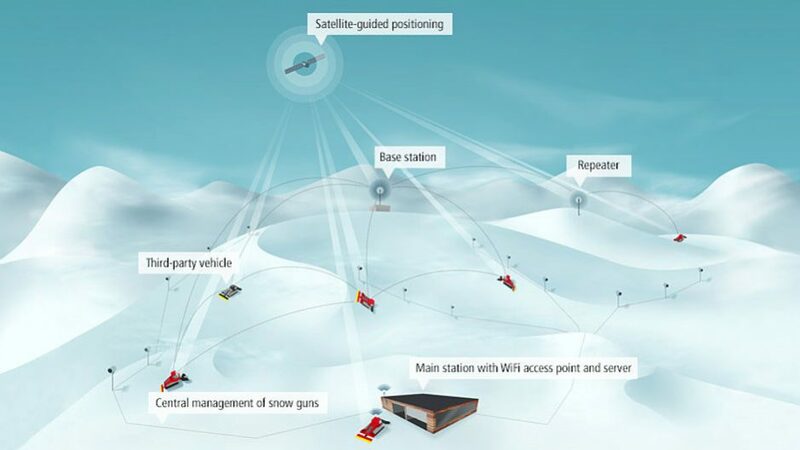 When the vehicle is within range of a SNOWsat WiFi access point the data is automatically transmitted to the SNOWsat server and stored there. SNOWsat also provides the driver with an overview of all important information. It actively supports orientation around the site – regardless of the weather or visibility conditions. In addition to displaying snow depths, slope edges, snowmaking facilities, roads and paths, the system also warns drivers of danger zones and alerts them to the presence of other snow groomers and their winch ropes, if these vehicles are equipped with SNOWsat systems. Your PistenBully or even an off-brand vehicle are equipped with the chosen SNOWsat vehicle system. This can be done either when it is produced, or locally at the ski resort. There are various systems to choose from, individually tailored for slope management and/or complete fleet management.